The Micro-SATA to SATA Adapter turns the Micro-SATA connector on a 5V or 3.3V Micro-SATA hard disk drive into a standard SATA connector. The Micro-SATA connector is commonly found on 1.8" solid-state drives (SSD). 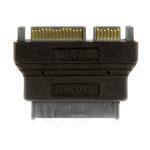 This compact adapter includes both the power and data portions of the SATA connector. RoHS compliant. Gold-plated connectors.